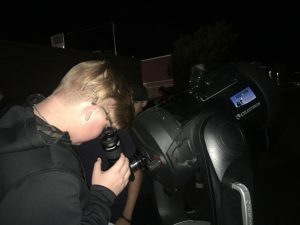 Students enrolled in Geoscience for the 2017-2018 year along with their family and friends, had the opportunity to view space with the use of high power telescopes on Sept. 19 in the back of the school by the portables. Las Vegas Astronomical Society (LVAS) volunteered to share their passion and knowledge of astronomy with the Cougs. 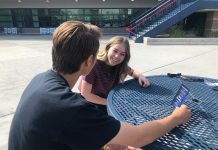 Geoscience classes are currently learning about space, and LVAS gives students the opportunity to take a closer look at what they are learning. The telescopes allow students to view the Las Vegas night sky up close. “It was pretty cool and a once in a lifetime experience. 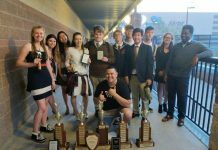 I would recommend it to anybody interested in learning a bit more about space,” Brennan Moore, junior said. LVAS astronomers informed students more information about what they were noticing in the night sky. They taught about them about the main sequence of Saturn, the age of the stars, and about the brightest star in the solar system, Vega. “We’re currently studying space and the universe and it is a great opportunity for LVAS to come with their high-tech telescopes and let us observe space,” McSorely said. Some geoscience teachers even offered extra credit to get students involved and interested in what they are currently learning in class. Teachers gave students a half sheet of paper with a few questions they had to answer about their findings. “I told my family about the event because I thought it would be a good idea to get extra credit. 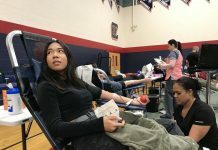 My family and I both did enjoy it because it’s something we’ve never really done before,” Sterling Penny, sophomore, said. Previous articleWhat is your dream music festival lineup?